The adaptive cruise control is a combined speed and distance control system to assist the driver. Adaptive cruise control allows you to maintain any desired constant speed between 30 and 200 km/h. In addition, the system controls the distance maintained to the vehicle in front (subject to certain limitations as described below). The system can be used to greatest effect on long motorway journeys or on other main roads with long straight sections. How is the system operated? The adaptive cruise control system is operated via a control lever on the steering wheel, “Setting the speed” and, “Setting the distance”. When the system is being used, important information is displayed in the speedometer and on the instrument cluster display screen, “Driver messages”. The adaptive cruise control has certain limits determined by the system itself. This means that the driver may in some situations have to intervene and control the speed and distance to the vehicle in front himself, “Driver intervention prompt” and, “System limitations”. Please always direct your full attention to the road, even when you are using adaptive cruise control. It is always the driver who is responsible for determining the speed and for keeping a safe distance to the other vehicles on the road. • For safety reasons, the adaptive cruise control must not be used in city traffic, stop-go traffic, roads with a lot of bends or in difficult driving conditions (such as ice, fog, loose grit or gravel, heavy rain, aquaplaning) - this could cause an accident! • When you take a turn-off, drive along a motorway exit lane or pass through roadwork sections, please temporarily switch off the adaptive cruise control in order to avoid the vehicle accelerating to the selected speed. • The adaptive cruise control can only control the distance to vehicles in front. As a rule, it cannot recognize vehicles travelling in other lanes. For this reason, please temporarily switch off the system if you are travelling in the inside lane and vehicles in the overtaking lane are travelling at a slower speed than you are. Otherwise, you would overtake these vehicles on the inside. • Adaptive cruise control will not react when approaching a stationary obstacle, e.g. the end of a traffic jam or a broken-down vehicle, or if a vehicle should come towards you in the same lane. • Please make sure you do not unintentionally rest your foot on the accelerator - this will override the adaptive cruise control system which, as a result, will not automatically brake the vehicle. 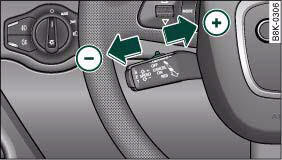 • For safety reasons, the speed setting will be deleted when the ignition is switched off. • Switching on the adaptive cruise control automatically activates the Electronic Stabilisation Program (ESP) and the traction control system (ASR). These two systems cannot be deactivated while the adaptive cruise control is switched on. • Damage caused by impacts (e.g. if the vehicle is damaged when parking) can affect the radar sensor settings. This can cause the system to malfunction or switch off completely. • The radar sensor is heated. 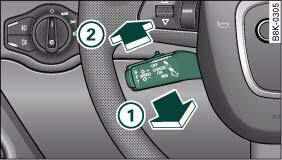 However, in winter conditions, you should make sure that the radar sensor is free of ice and snow before you set off. If necessary, carefully clean the cover of the radar sensor and the surrounding area, fig. 136. 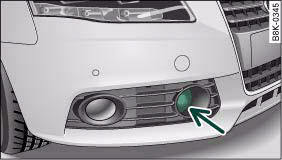 • To make sure that the radar sensor is fully operative, do not attach any objects (e.g. stickers, add-on parts or other accessories) to the area surrounding the radar sensor. Do not paint the area surrounding the radar sensor. The driver of a vehicle with a manual gearbox of course has to change gears as appropriate, even when the adaptive cruise control is activated. The adaptive cruise control is available from the second to the sixth gear (when driven in normal engine speed range). 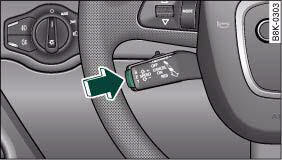 When the adaptive cruise control is activated, the driver must press the clutch pedal as normal in order to change gear. When changing gear or pressing the clutch pedal (for up to 20 seconds), the adaptive cruise control will remain activated. When changing gear, the driver does not have to accelerate after engaging a gear as the engine torque will be coordinated by the adaptive cruise control. 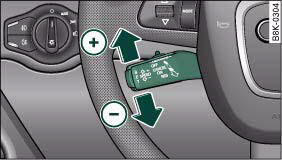 • The adaptive cruise control cannot be activated while changing gears. How does the distance control work? Vehicles in front are detected by a radar sensor. 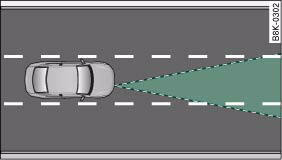 The adaptive cruise control uses a radar sensor ⇒ fig. 137 which is integrated in the front of the vehicle and is subject to certain system limitationsgggggg 140. Stationary objects are disregarded. The system requires reflecting surfaces in order to be able to measure the distance. If the ACC is unable to measure the distance it will not respond. When there is no vehicle in front, the adaptive cruise control works like a speed control system. It maintains a constant target speed specified by the driver. If you catch up with a vehicle driving in front, the adaptive cruise control will reduce the speed accordingly (within the limits set by the system, “Driver intervention prompt” and, “System limitations”) and adapt it to the speed of the vehicle in front. Then the system will try to adjust the distance to the car in front according to the settings selected. During the adjustment process the system may temporarily not be able to adhere to the distance you had specified ⇒ in “Description” on page 128. If the vehicle in front accelerates, the adaptive cruise control will also accelerate, up to the target speed you have specified. In some situations, it is necessary for the driver to brake the vehicle with the foot brake in order to keep a safe distance to the vehicle in front or to avoid a collision. In this case, a warning message will appear in the display and you will also hear a warning tone. When you move into the overtaking lane and no vehicle is detected in front, the adaptive cruise control will accelerate up to the target speed and then maintain it. You can still use the accelerator pedal at any time to increase speed in the normal way. The previously programmed speed will be resumed when the accelerator pedal is released. • Please note that acceleration will vary depending on the preset programme. If you have, for example, selected “Distance 1” and the driving programme “dynamic”, acceleration will be more "sporty". 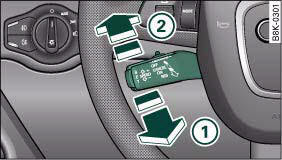 However, if you have set the system to “Distance 4” and driving programme “comfort”, acceleration will be more gradual. For a detailed description please refer to, “Setting the distance”. • No vehicle in front, Vehicle in front and a Driver intervention prompt will be indicated by an indicator lamp, “Indicator lamp and display in the speedometer”. – Pull the control lever to position 1 ⇒ fig. 138 to switch on the system. – Press the control lever to position 2 (click stop engaged) to switch the system off. Important: The system must be switched on. – Drive at the desired speed. The speed must be in the range between 30 and 200 km/h. – Press the SET button -arrow- ⇒ fig. 139 to confirm the target speed you wish to store. When the SET button is released, the current speed is stored in the memory and the vehicle will then maintain this speed. One or two red diodes will light up in the speedometer dial to mark the speed which is currently stored in the system. At the same time, the speed will briefly be displayed in the system status indicator. For safety reasons, the speed setting will be deleted when the ignition is switched off. – Briefly move the control lever up towards + ⇒ fig. 140. The speed will be incremented by one graduation on the scale in the speedometer. – Press the control lever up towards + and hold it in this position. The speed setting is indicated by the diodes in the speedometer; the speed will be increased accordingly. – Briefly move the control lever down towards -. The speed will be reduced by one graduation on the scale in the speedometer. – Press the control lever down towards - and hold it in this position. The speed setting is indicated by the diodes in the speedometer; the speed will be reduced accordingly. After releasing the control lever, the system will adapt your speed to the setting you have selected. Following any changes, the new stored speed will be displayed briefly in the system status indicator. You can still use the accelerator pedal at any time to increase speed in the normal way. The previously programmed speed will be resumed when the accelerator pedal is released. You can set a new speed at any time by pressing the SET button ⇒ page 131, fig. 139. In some situations it makes sense to switch off the system. – Press the control lever in direction ⇒ fig. 141. It is dangerous to resume a set speed which is too high for the current road, traffic or weather conditions - risk of accident. When switching off the system (with speed memory function) the speed stored at this point remains in the memory. The distance can be set in 4 different stages. – Briefly press the sliding switch ⇒ fig. 142 once towards + or -. The display in the instrument cluster will briefly show the current distance setting. – Press the sliding switch again towards + or - to increase or reduce the distance by one level at a time. The adaptive cruise control system determines the distance to the vehicle in front by time intervals. It defines a time-based distance to the vehicle in front which is kept at a constant level. This converts to a distance which depends on the speed - the higher the speed, the higher the safety distance in metres ⇒ . The actual distance maintained by the adaptive cruise control can be longer or shorter, depending on the traffic situation and the driving style of the driver in front. You can control the acceleration and braking response of your vehicle in adaptive cruise control mode by adjusting the settings on the sound system or MMI*gggggg 139. Depending on the driving program and distance selected, acceleration and braking response will range from dynamic (1) to relaxed (5). When setting the distance, the driver is responsible for adhering to the laws and regulations which apply in the country he is travelling in.